It has been a month since our last update and it’s the first time we’ve moved to our new “monthly” update system. So grab a drink, maybe a snack, and get ready for a longer update than normal. And after you’ve read through this, we’ll have a little request for help. First, we have a new system open! This is YZ Ceti, a red dwarf approximately 12 light years away from Old Earth. Despite being rather close to Tau Ceti, YZ Ceti’s lone jump gate connects to L 726-8, making it the first star system in the Tau Station universe which does not have a jump gate connecting it directly to Sol. YZ Ceti has four Consortium stations levels 19 through 20. As another major change, citizen tier levels are now capped at the max tier level as developed stars. In the long run, this should help with the common concern that citizens have expressed when they advance faster than civilization can provide them with the supplies they need. In the short run, some players will have to make adjustments. This is one of the interesting aspects of enjoying an alpha 😃 Please note: the highest station level is currently 20 which reflects tier 4, but as some of you already made progress to tier 5, the slightly higher level-cap of max 25 will remain. Once we have the first level 21+ station (i.e. tier 5), the new system will apply. Many new university courses have been developed. These include combat stim courses to allow you to take a stim in combat and still get a hit in. This, combined with lower toxicity of military stims and all stims giving greatly increased boosts should make stims an interesting option in combat. Other courses include ship engine repair and ship hull, navigation, and life support maintenance. These allow citizens to repair ships faster, reducing costs and getting them flying again. And speaking of flying, since YZ Ceti doesn’t connect directly to Sol, the Multi-Jump Ship Navigation courses have been released, allowing you to pilot across more than one jump gate on a single trip! There’s also been a lot of work with the messaging system, streamlining some messages, removing others which provided no value, and generally digging into messaging in preparation for more improvements in the future. And while we’re talking about the future—the new citizen experience is being heavily worked on. Some issues are simple, such as the avatar for Evangeline, the first NPC new citizens should encounter. Other improvements include providing them with 20 genetically bound tier 1 rations to give them a head start in understanding the universe, and providing popups to explain what to do when their stats run too low. However, we’re going to extend those popups to everyone for now. These popups will appear only once per area/action, so you shouldn’t be overwhelmed with them. This is where the aforementioned “request for help” comes in: we’d like you to give us feedback about those popups. What works, what doesn’t, what’s broken, and so on. We think they’re pretty awesome; we’ve been wrong before 😃Just keep in mind that they’re actually targeting new citizens. After you’ve had a chance to see them, we’ll restrict them to new citizens again. A new system extends our current universe, adding 4 new stations which are all under control of The Consortium. YZ Ceti Jump Gate (level 19). Cap Verde Stronghold (level 19). Spirit of New York City (level 20). ‘My Savior’ (level 14) on The Spirit of Tianjin, part of the L 726-8 system; no further preconditions. Spirit of Tianjin in the L 726-8 system now has an “Enter the Sewers” campaign. Combat (bugfix) – Running out of focus in combat now sends you to the Sick Bay instead of the brig. In the future a new pop-up will inform you about details, also when there is no Sick Bay. Wallet (bugfix) – Fixed floating point issue with wallet/bank accounts which could sometimes make you unable to empty your wallet or bank account. This should fix issues where credits show up with more than two decimal places (knock on pseudowood). Campaigns (result page) – A new page shows the results of the recent Syndicate Campaign. Combat UI (gear condition) – As suggested on the forums, the durability of your weapons and armor are now shown, similar to the percentage displayed in your inventory. This way you know when repairing is needed without the need to check your gear after a fight. Combat UI (encumbrance) – The status of carrying too much has been added to your character’s screen; next to toxins, below your stats bars. Rations (renames) – Following your suggestion, ration names have been shortened. This resolves the need of opening the item’s detail view if you want to check the tier information, because the name was too long. With the new names like “Tier 2 Ration” all details needed are shown at first sight. Areas (additions) – Orwell Station in L 726-8 now has a shipyard. Areas (additions) – All jump gates now have an Inn, Hotel Rooms, Bar, and Lounge. Areas (additions) – All clonevats are now guaranteed to have one non-premium clone option. New players (player experience) – new players will start with an additional 20 genetically-bound tier 1 rations. New players (player experience) – New players will now see a popup when their stats are too low. This popup will explain various ways of increasing their stats so they can keep playing. 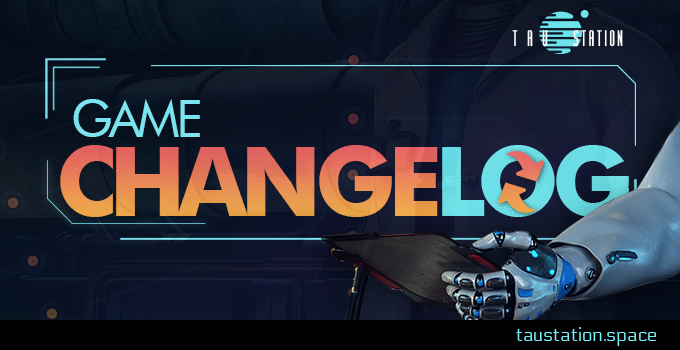 New players (player experience) – The first NPC you meet, Evangeline, now has a custom avatar (’bout time!). Inventory UI (enhancement) – Genetically bound items are now shown as such in the inventory. Messages (enhancement) – Withdrawing credits from the bank now generates 2 messages instead of 5. Messages (enhancement) – We no longer show stat increases when they’re 0 (zero). Messages (enhancement) – Increases in toxin levels are now shown as a percentage, instead of a narrative description like “slightly increased”. Messages (enhancement) – Certain messages which added items to inventory have been significantly shortened. Items (enhancement) – All stims now offer 50% greater benefit for stat boosts, but their market value has been kept the same. Items (enhancement) – Military stim toxicity has been significantly reduced. Items (enhancement) – All stims should now have images and not just the default stim image (note: the default stim image may have matched the correct stim image, too). Items (enhancement) – Items which gives bonds have new names, descriptions, and artwork. Missions (enhancement) – Show station name in Discreet Work start and end steps so that when player changes station during discreet work the mission history clearly shows the job is on a different station. Gameplay (enhancement) – Character tier can no longer exceed max station tier, but as the max was level 25 – this limit remains and won’t be reduced. University courses (additions) – New courses for combat stims. These give increasing ability to take a stim in combat and still attack the other player. University courses (additions) – New courses for ship hull maintenance, life support maintenance, advanced navigation, and ships engines. Area Description (Cloning Vats) – We added a missing “o” to the ‘pod’ on Orwell Stronghold station. Area Description (Interstellar Shuttle) – The area’s text at the station L 726-8 Jump Gate now better reflects the (current) travelling situation. Area Descriptions (L 726-8 system) – A compilation of 8 findings on all 3 stations with minor typos in mostly area descriptions, but also in 2 NPC texts has been processed (thanks to Xierumeng). Area Descriptions (726-8 Jump Gate) – Pending station main descriptions have been added. Area Description (The Wilds) – A missing “y” has been added to the local narrative text at Sol Jump Gate. Item (Heavy Diffusion Armor) – A word in the description text changed; now it’s “thick batting” as intended. Item (various) – Weapons descriptions have been improved for Thowan-89, Dur-Zip-Zap, Corvo, Tenderizer, BuzzC7, First Mate’s Input, Trusty Hand, Platinum Cestus. Mission ‘All that Glitters’ (expression) – A confusion discussed on the forums has been resolved by changing the according saying to “money changes hands”. Mission ‘Fanning the Flames’ (various) – Thanks to Perleone who spotted a few typos and shared those on the forums; all has been taken care of! Mission ‘From the Ashes’ (word) – Now you ‘begin’ your climb at the broken wall. Mission ‘Last Night in Paris’ (NPC name) – During the dialogue with Nicole, a wrong name was mentioned which had no impact on the mission, but it was eventually confusing. Now it’s all about Nicole as intended. Mission ‘Stealing from Ghosts’ (duplicate word) – When Billy Bob is thirsty at the bar, one possessive pronoun is enough to indicate, it is “his” near-empty glass.